Whether it's brunch, lunch, high tea or dinner, make her feel special on May 8. 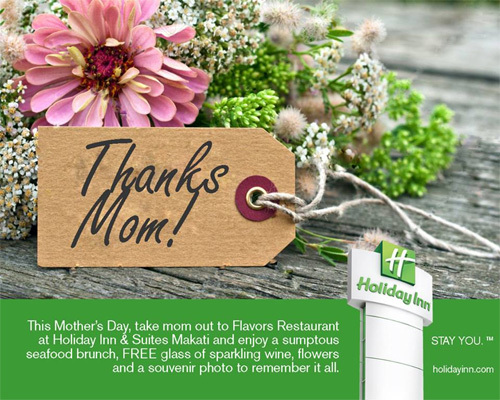 Take your mom on a glamorous treat with a hefty meal, bundled with glitzy surprises at the hotel’s Marriott Café. The sumptuous buffet features a Gambas station, freshly-prepared sushi and sashimi, noodles and dimsums, and a selection of pastas. The Filipino station features local favorites such as bulalo and kare-kare, or get your fill of teppanyaki. Other highlights include US Prime Rib Eye, Foie Gras, and the Sustainable Seafood choices on ice. Finally, end your meal with halo-halo, gelatos or crepe. Buffet includes free-flowing sparkling wine and martini bar. Marriott Café’s bountiful dinner buffet is at P2,650 nett and extravagant Sunday brunch is at P2,800 nett. Glamorous treats like prizes from Michael Kors, Tory Burch, Bobbi Brown and Contours PH are also up for grabs. Call 988-9999 for reservations. The hotel's thank you treat is a Lunch or Dinner Buffet at P1,399 nett per person. 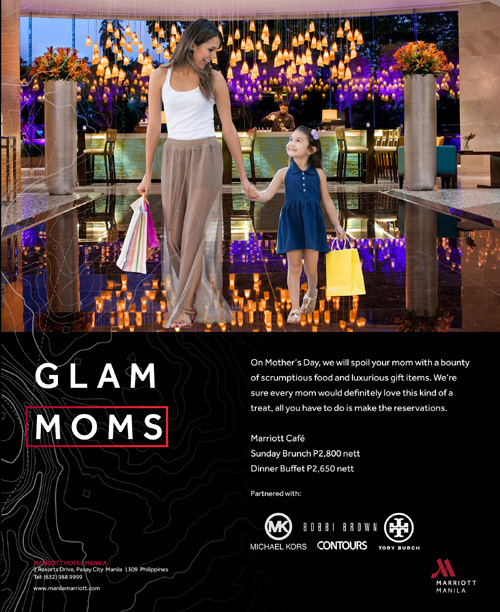 For the whole month of May, moms can also dine for free when accompanied by at least two (2) paying guests at F All Day Dining Restaurant. Call (02) 928-9888 for reservations. Treat Mom out to a Sunday Boutique Brunch Buffet, P1,100++ per adult and P650++ for kids 12 years old and below, from 10:30 am to 3:00 pm! 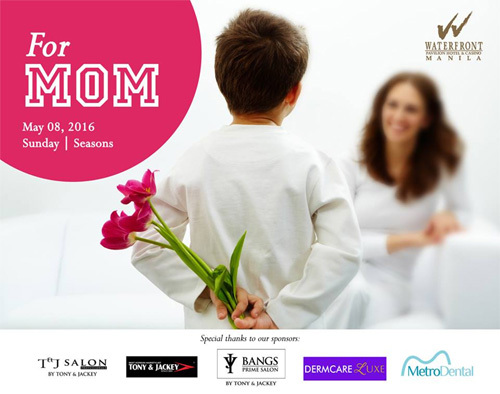 Moms will also receive special gifts from M Cafe and its partners, Vedette PH and Summit Media. Call (02) 757-3000 for reservations. 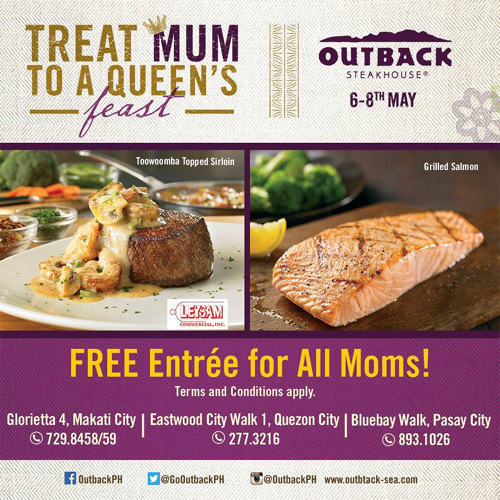 Celebrate Mom's Day at Outback Steakhouse and get a free entrée when you dine with mom. Simply purchase a minimum of four entrees, and the entree with the lowest amount is free. Early reservations made from for May 6 or 7 will get a free Chocolate Thunder from Down Under. 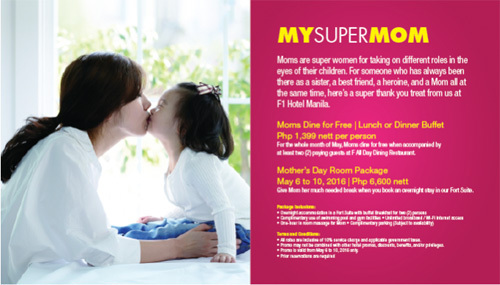 Dining moms on May 8 will receive framed photo with their loved ones, gift vouchers and a special gift. Call their branches (phone numbers in the poster above) to make reservations. 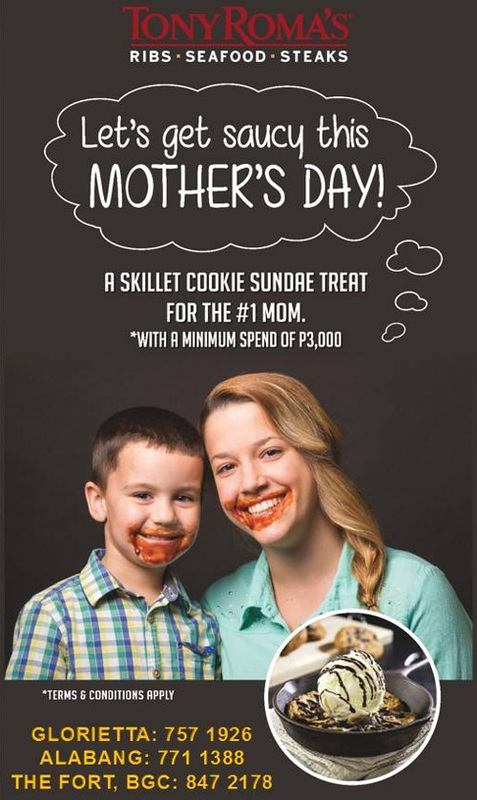 Get a free Skillet Cookie Sundae Treat when you dine with mom with a minimum purchase of P3,000. Available at their Glorietta, Alabang, and The Fort BGC branches. 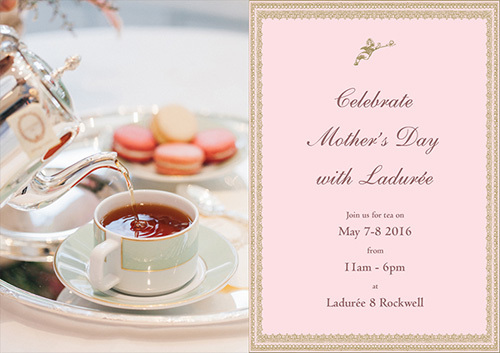 For Mother’s Day weekend (May 7 and 8), guests at Ladurée Manila at 8 Rockwell Center will be treated to an exclusive menu and an even sweeter treat for mom: an offering of elegantly-packaged chocolates and macarons that are fit for a French royal. Ladurée is located at the Ground Level of 8 Rockwell Center, Hidalgo Drive, Makati City. Call Ina at 0917-301-2188 for questions and reservations. 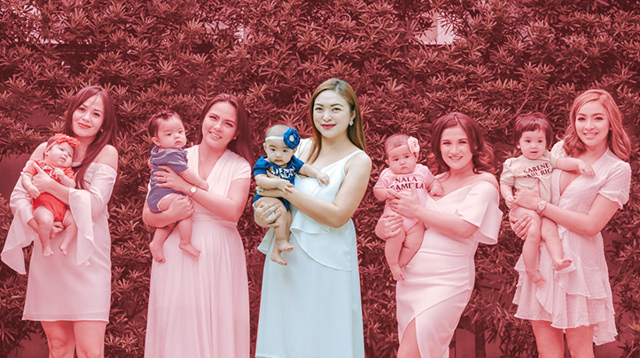 Celebrate Mother’s Day by capturing the special moment with mom in Sofitel's photo booth. 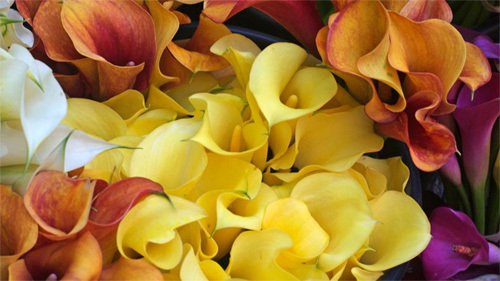 Dine with your loved ones as you’re serenaded by the acapella group Band of Brothers and enjoy brunch with a special table centerpiece featuring a photo of your child and a flower from Botanicals. 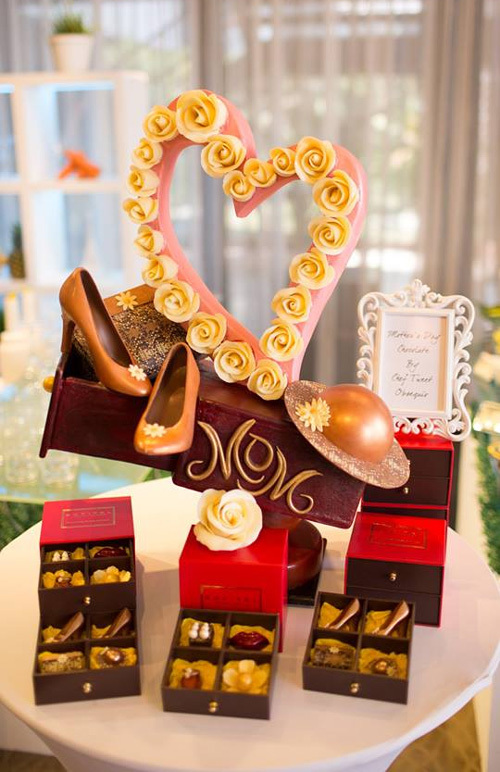 Children are in for an exciting chocolate treat as they prepare sweet gifts at the Chocolate Atelier for their beloved moms. Artisan Pierre Marmonier will present how to prepare his special homemade jam with floral tea and give a special taste of home. Receive a luxurious pampering session courtesy of Nail Artisan and Le Spa and get a chance to win special prizes from our partners Coach, Lancôme and Shu Uemura. 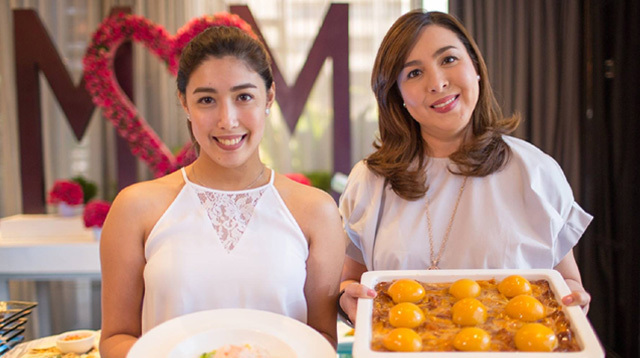 Read more about the special buffet dishes prepared by actresses Janice de Belen, Lotlot de Leon and Marjorie Barretto here. Call (02) 551-5555 for reservations. 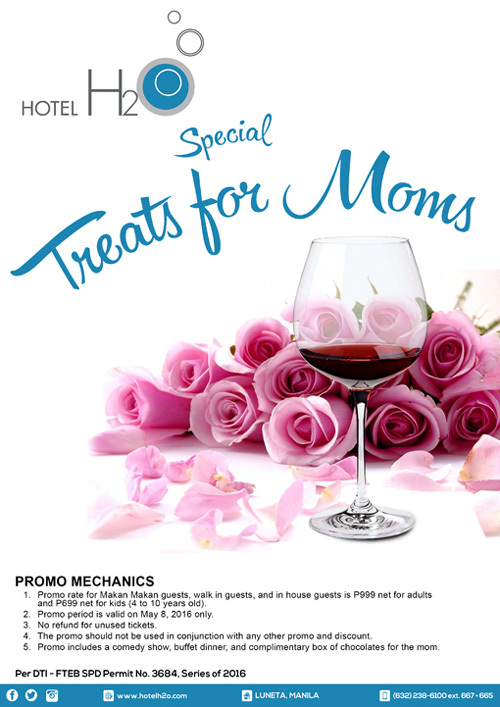 For P999 (adults) and P699 (kids) per head, enjoy a buffet dinner, a comedy show, and a complimentary box of chocolates for Mom. Call (02) 238-6100 for reservations. 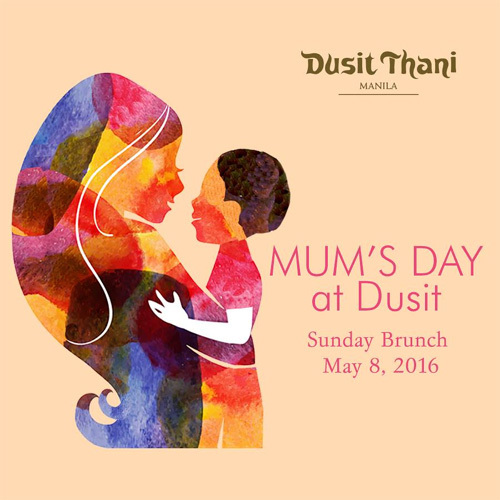 The hotel's Mother’s Day brunch buffet is happening at Escolta. For P2,650++ per adult and P1,300++ per child, have a smorgasbord of local and international favorites from the restaurant’s vibrant open-plan kitchens and live stations. Early celebrators on May 6 and 7 will also enjoy the Seafood Dinner Buffet for P2,000 per adult and P1,050 per child. Call (02) 887-2888 for reservations. 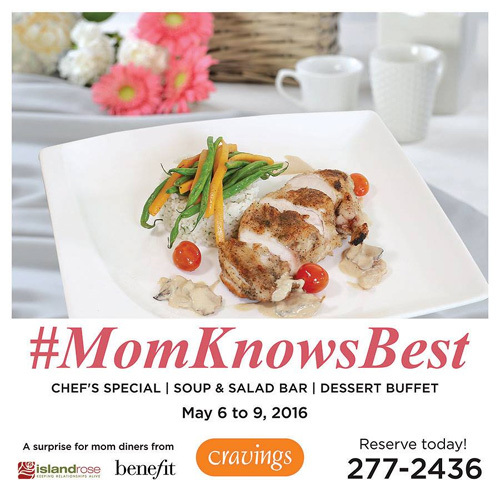 Celebrate motherhood in an extraordinary way at the hotel's Seasons Restaurants. 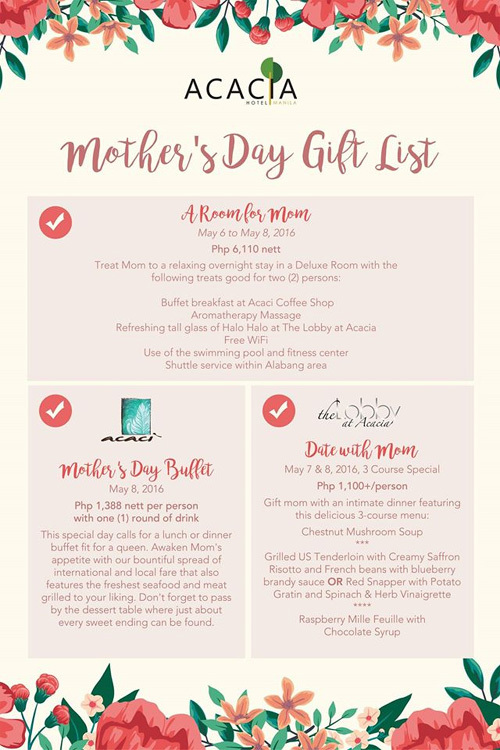 Mother’s Day cake and special gifts are given away for every group of three or more who dines in. Call (02) 526-1212 for more details. 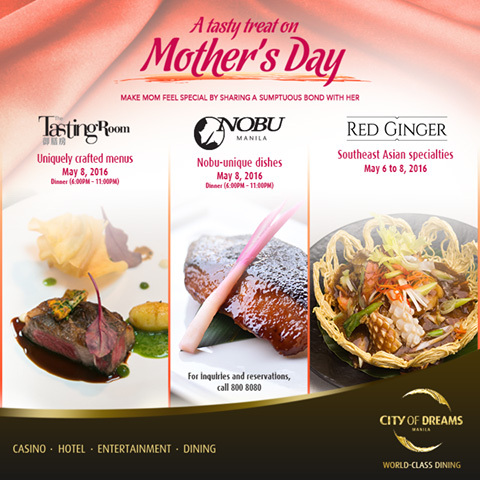 From 11:30 am to 2:30 pm, treat mom to a special lunch buffet with Dusit Thani Manila's Crossover Reloaded Sunday Brunch, starting at P2,500++ per person. Let her indulge on the Japanese cuisine offered buffet style at UMU, and then crossover to The Pantry for Asian and international cuisine. 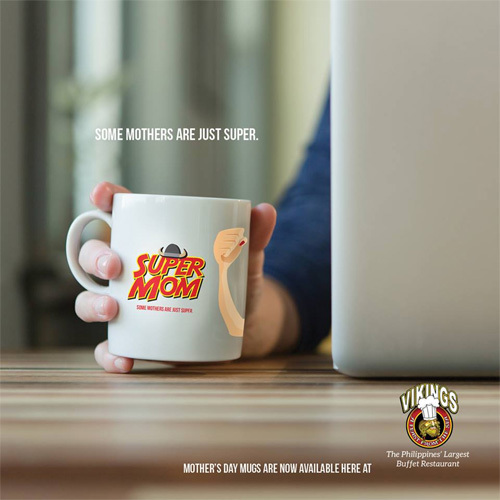 The first 200 moms availing of the brunch will get to bring home special giveaways, while three lucky mothers will win gift certificates. Call (02) 238-8888 for reservations. Awaken Mom's appetite with the hotel's bountiful spread of international and local fare that also features the freshest seafood and meat grilled to your liking for only P1,388++ per person. Don't forget to pass by the dessert table where just about every sweet ending can be found. Call (02) 720-2000 for reservations. At Flavors Restaurant, her day will be made even more delightful by the hotel's spread of fresh and sumptuous seafood, a complimentary glass of sparkling wine, flowers, and a souvenir photo. Call (02) 909-0888 or email at hism.fb@ihg.com for reservations. Besides the mouthwatering buffet priced at P2,800 nett per person at Corniche, two cooking demonstrations will be conducted by no less than the Executive Chef and the Executive Pastry Chef, and a roaming magician will entertain the guests. Plus, for every group of four, mom gets a special gift--a dessert selection in the hotel’s signature takeaway box. Call (02) 528-3000 or (02) 305-3000 for reservations. 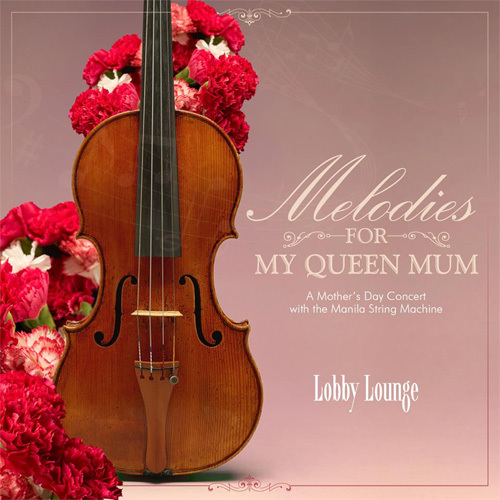 Spend a regal Mother's Day at Makati Shangri-La with Melodies for My Queen Mum from 3 to 6 p.m. at the Lobby Lounge. 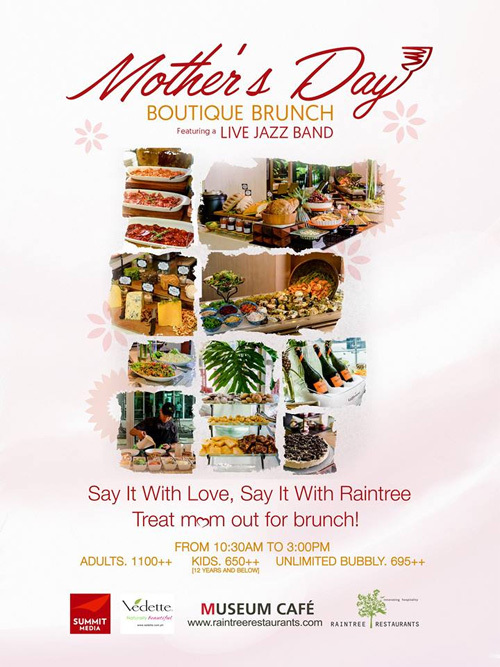 Treat your beloved mother to a delightful afternoon tea buffet and let Manila String Machine serenade you with classical favorites. Call (02) 814-2580 or email rric.slm@shangri-la.com for reservations. 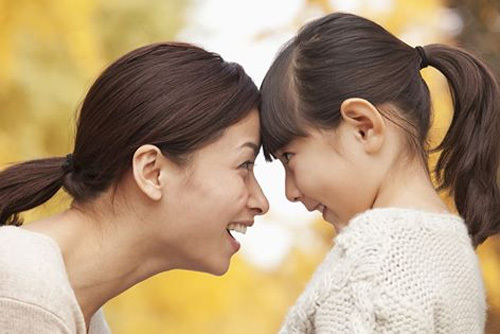 Treat Mom to an unforgettable dining experience with exclusive Mother’s Day menus at Nobu, The Tasting Room and Red Ginger. Call (02) 800-8080 for reservations.